Fast turnaround and high quality Tape to DVD Transfer services as low as $9.95 per video tape. Quick turnaround and high quality CD & DVD Duplication services as low as $0.60 cents per disc. Award winning marketing video production services for web, broadcast and direct marketing. On-location fast turnaround high quality 35mm slide scanning and 35mm slide processing services. Professional DVD Video Slideshow and CD Photo Montage service for personal and business events. Express photo slideshow service that meets production deadlines. Real Estate Photography that actually sells the property. We take photos of both types – interior and exterior elevated and aerial views of real estate property. Professional Portraiture by an award-winning photographer for business marketing, professional portfolios and resumes. Orlando group and event photography for business and personal events. Special discounts to repeat customers. Performing Arts Videography and complete in-house video production services for dance recitals, dance competitions, theatre, music recitals, arts shows and concerts. High quality photo restoration service for film and printed photos that require simple or extensive damage repairs or photo enlargements. For service questions and appointments email or call our Orlando Orange County location at (407) 610-2451 for same-day service availability. If we do not answer the phone, we’re either providing video production services on location or have a photo studio session in progress. Please leave us a message or send us an email and we will get back to you shortly! You can also call us later if you’d like. We always return phone calls and reply to email messages. Vaskevich Studios is an Orlando’s based award-winning and nationally recognized video production, photography, event videography and digital multimedia production company. 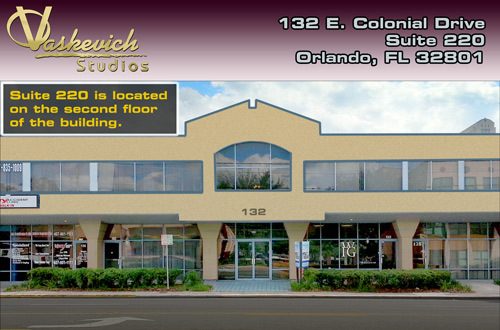 It is conveniently located in the center of Orlando / Orange County district. Over the years, Vaskevich Studios has won numerous awards for its outstanding video production, photography and multimedia production capabilities, effective project execution and high level of creativity. As a creative video production and photography company, Vaskevich Studios supports the Orlando’s creative community by periodically donating its photography and video production services to local artists, performers and non-profit organizations via philanthropic contributions. All photo studio and video production services and products provided are guaranteed for quality and on-time delivery. All of our commercial photography, video production, optical CD/DVD media printing, duplication and visa and passport photo services are rendered on-site. We do not outsource or resell other companies’ creative services such as photography, audio and video production, audio and video tape media transfers and disc duplication. Therefore, we are in complete control of the services provided, scheduled delivery and guarantee a complete implementation of each client’s project specifications. Our customer service oriented approach has allowed us to stay competitive in the media production field and accumulate customer loyalty through the years. The quotes we provide are precise; we pay attention to details and stick to the production schedule and budget.